It's the final Wizardry in Progress of 2018! What a solid year for projects! As it has been Christmas time, I didn't have a lot of time to do anything major this week. I did bring home a piece of terrain from the game shop and did a little refurb job on it. This is an old Manufactorium that I had assembled earlier in the year for the game shop. Over the course of the year, I've decided that it needs to be based and the two sections need to be tied together. Let's take a look at the last project of 2018. The Brush Wizard's 2018 Year in Review! It's been a hell of a year in 2018, this year I went to 4 different conventions, upgraded the hobby desk again, started up a YouTube channel, I entered painting competitions and gained a couple medals. The year seems like it has completely flown by and I didn't do a whole lot. In actuality I've done so much stuff! Let's take a look at what's all happened in 2018. It's bee a fairly solid week for hobby this week. I managed to assemble a new Onager Dunecrawler, I picked up another set of Promethium Relay Pipes and finished up the Death Company jump marines. I also finally glued the Sicarian Ruststalkers to bases. Alrighty folks, its time for the last section of Let's Paint: Blood Angels Terminator Captain. In this one I go over purity seals and how to paint lenses. I had originally intended to show off how to paint his skin and hair as well but had technical difficulties with the palette camera. This week has been hectic with the upcoming holidays and such, it's also been a bit of a downer as I announced on Monday that I was halting Let's Paint for the time being. But progress must be made and that's what today is all about! This week I managed to finally finish the Baal Predator, which means all single model units for the Blood Angels are done. Now it's back to infantry painting hell with a squad of Death Company that I've been starting and stopping for the entire project. Hey there everybody. Today I have an announcement, which has been a tough call to make. Due to the holidays, the Blood Angels commission and not having a ton of free time I can't keep up with producing content for Let's Paint right at the moment. So, Let's Paint is going to go on hiatus. It's time for the 3rd episode of the Blood Angels Terminator Captain series! In this one I show you how I painted the gemstones and the gold sections. It's really rather easy! I very nearly forgot that today was Wednesday! This week I only managed to do more work on the Baal Predator and the red armor is very nearly finished. There's only a couple of sections left for the main guns and then its on to some weathering and then details. Hey everybody, it's time for part two of the Blood Angels Terminator Captain. In this one I go over how to do the bluish-black leather on the loincloth and cape. It's time for your weekly update of hobby progress! This week I mostly did work on a Baal Predator and finished the Mars rover while also gathering some new toys. 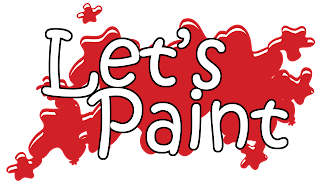 Hey everybody, it's time for the new version of Let's Paint! In these new episodes I now go over what I am doing and demonstrating it so you can follow along, rather than just being a straight time lapse of painting a miniature. The video is no longer a straight start to finish paint job. Now parts of the miniature will be pre-painted off camera and used as examples. I feel like this version is the version that this YouTube series was always meant to be, and I can say that I am really pleased and proud with these new videos. In this video, we get started on the Terminator Captain by painting his red armor. Another fairly light week this week, but some progress was made. Mostly I got to painting the mar rover model for the Terraforming Mars board game and put together a Baal Predator for the Blood Angels commission. Hey all, in this one the model of Takata himself is getting all finished and ready for his base! Hey everybody, it's time for part 5 of Let's Paint: Takata! U-Con is mere days away and I'm hammering out progress like no one's business! The terrain is all set to go, as is the Primaris Librarian. The only thing left are the Primaris Intercessors, which are coming along nicely. Hey everybody, its time for the next episode of Let's Paint: Takata and to finish the armor plating. We're past the halfway point of this series with 3 more episodes left to go! Its a week and a half til U-Con and I'm still toiling away at everything I need for it. This week as seen a flurry of terrain work and a start on the Primaris Marines I need for the Deathwatch side of the armies. It's been a whirlwind of activity and I managed to get a bunch done. This is a big one, let's take a look! We're nearing the halfway mark for Takata. Today we are going to do more of the body armor and the scarf. It's another busy week as the lead up to U-Con continues! 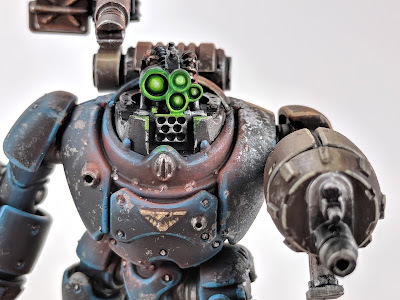 This week I knocked out the Redemptor Dreadnought, started on the Sector Mechanicus terrain and did some more on my buddy Mark's Death Company. In this one, we continue on the armor plating of the head and face. It's been a busy week over here and I've been hard at work making terrain and trying to sort out the amount of table coverage I have for U-Con 2018. I've gathered up all my terrain from the game shop, based my pipe kits and started building new pieces. There's much to get done for next month. Let's take a look at what I have done so far. Alright! 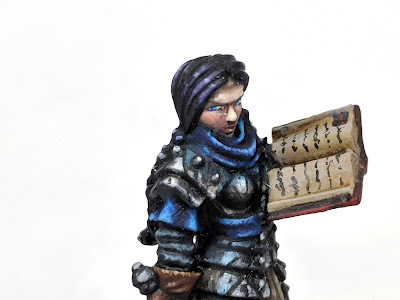 Its time for a new Let's Paint series and this one is for Takata from MidKnight Heroes, a newish Chibi miniatures company. They just recently funded a 4th round of models for their company, which is currently in production and this fella is from one of the previous ones. This is the first video in a series of seven! Stay tuned each Thursday for new episodes. He's a neat little ninja dude with a ton of katanas, let's check him out! Hey all, it was a light week over here, as I mostly only painted the Terminator Captain on Monday. But he's nearly finished now, with just his head and a few details left to go. He should be finished tonight! Alrighty! Let's finish up C'thulhu! Other than the insane drying time I had to deal with while painting him without my hair dryer, he still came together really quickly. I feel that is partly because of the nature of the model. Thanks to the sponge painting I was able to get solid skin mottling done easily and quickly. I should have posted this on Thursday, but it completely slipped my mind. It's time to get started on the next project, which is a bust of C'thulhu from Black Heart Models. George was kind enough to send me this bust, so I could paint him at Midwest Miniature Madness last June. I painted this piece live at the convention, and it was the first model I painted there. As a result, there were a few bugs to work out due to painting out of my normal environment. It's Wednesday! That means it's time for Wizardry in Progress! This week I managed to get started on a Blood Angels Terminator Captain for the commission that I've been slowly plodding along with. I also did some work on a project I hadn't touched in two years, because I found some solutions to issues I had in the build. It's time to finished up Kommander Sorscha. She turned out really nice, except for the one side of her face, but I am proud that she managed to snag a bronze at the P3 Grandmaster painting comptetition at GenCon 2018! It's a light week this week, as I was busy moving my parents this weekend and every night since last Wednesday it seemed like something was going on. But, I did get a little bit of hobby done, and started work on the first video of a new series of tutorials I'll be posting in the nearish future. It's time for Let's Paint! We're 3/4 of the way through this one and Sorscha is looking very nice! Join me as we get more details done on her. Aside from getting a TON of editing done this week, I was able to play with a new toy, Lit glowing pigment!This stuff is super fun to mess with. 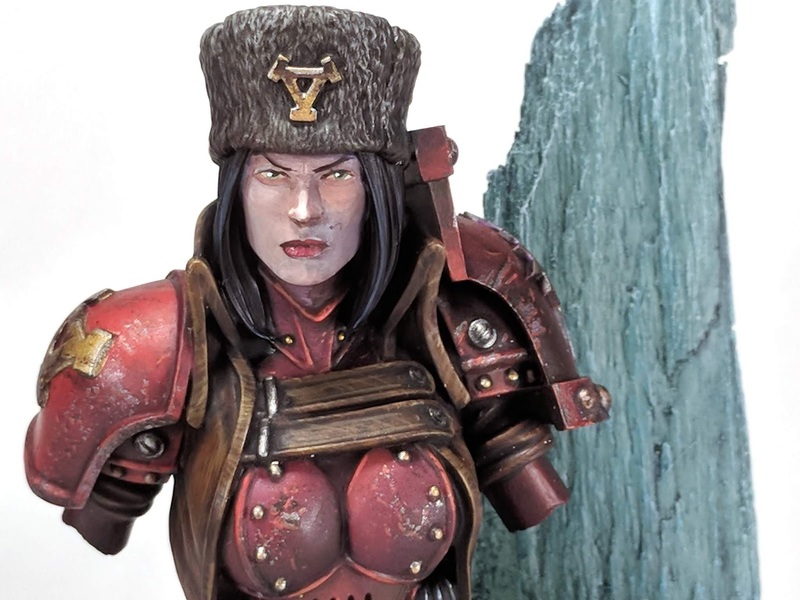 It's time for part 2 of the Let's Paint series for Kommander Sorscha! Lots of tinkering with Dreadnoughts happened this week, as I built a Redemptor and then used spare pieces from that kit to do more modifications to the Siege Dreadnought. Also, in the midst of it all, I finished the Blood Angels Terminator Librarian. 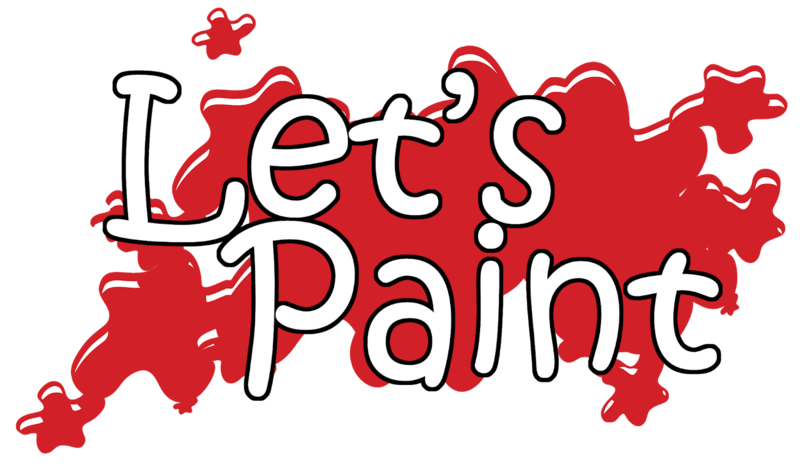 Hey there everybody, its time to relaunch Let's Paint! I've reworked the intro and outro, and gotten rid of a lot of the chatter. While I like sharing my thoughts on the models that I'll be working on, I felt that opening with speaking about what was about to happen was unnecessary. Instead, at the end of a series I'll have an overview and final thoughts about the project, much like previous video series. Anyway, it's time for Sorscha! It's been a pretty solid work week this week, and it feels good to get back into the swing of things. This week, I made an Inferno Cannon for the Siege Dreadnought I'll be using in an all Dreadnought list, I put some more paint on the Blood Angels Librarian and I made some terrain out of tin cans. Announcement! 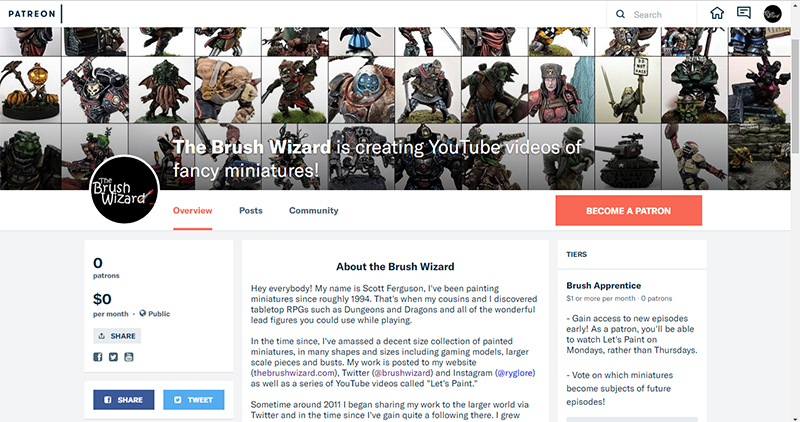 The Brush Wizard is now on Patreon! Today I have some exciting news that I can finally share with everyone!  The Brush Wizard is now on Patreon! Alirghty, its time for the first Wizardry in Progress since GenCon! It's been a rough start, getting the hobby train back up to steam, as I mentioned last week, but I'm now back at it and have continued work on the Blood Angels commission. On Monday, I got back to work on a Librarian in Terminator armor and also continued to record the process. Post-GenCon: What's Happening at The Brush Wizard? GenCon is now long over and what a weekend it was! It was a good time, as usual, and I got to see friends I only get to see once a year and made new friends along the way! But GenCon being what it is, there's never enough time for everything and everyone. I came out of the largest gaming convention in the country exhausted. The entirety of the previous week I was completely drained and tired, though I dodged the dreaded con crud. Most of the week was spent trying to recharge both mentally and physically. Much progress happened this week as I was able to finish Kommander Sorscha and build the base for Takata. There's still much to do in preparation for GenCon, but the end of the tunnel is nearing! As you may remember, if you've been reading for awhile, or following on Twitter or Instagram, I went to Illinois a few weeks back and hit up the Midwest Miniature Madness convention. While there, I painted up a few different things including a Primaris Intercessor and C'thulhu from Black Heart Models. Well, most of the weekend, I was painting this lady right here. The bust of Kommander Sorscha from Privateer Press. She was a blast to work on and I recorded the entire process for Let's Paint too. But for now, we're going to take a look at here now that she's all finished! 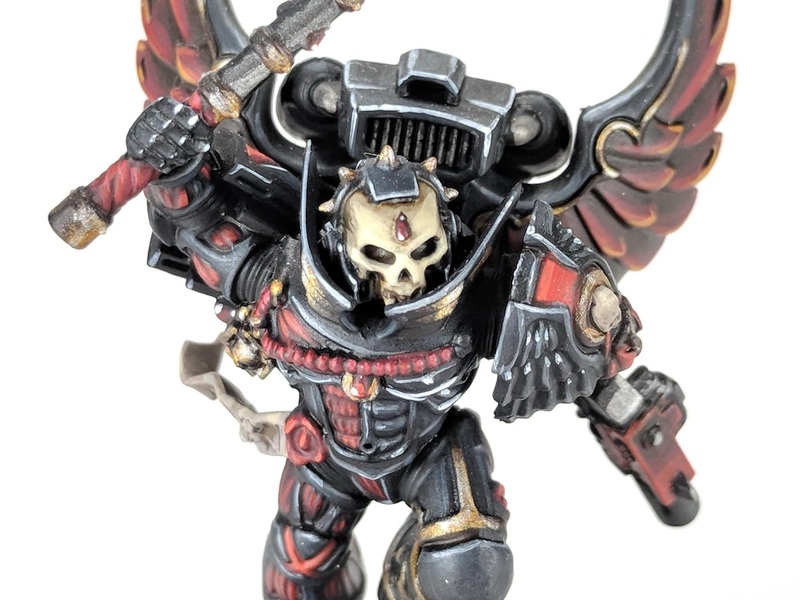 We're not two thirds of the way through the Death Company Chaplain Let's Paint series! In this one, I finish up the main body of the model, leaving just the base and jump pack left to go. He's coming along nicely. The summer lull continues, as I've had a lot of non-hobby related things happening lately. But I've been slowly making progress on things. After a weekend of house painting, I was able to get some more work done on Takata and started prepping a plinth for Kommander Sorcha. It's time for a new project and today we are getting a start on the Death Company Chaplain that I painted a few months ago. In this one, I get a solid start on the armor and his helmet. It's been a slow few weeks on the hobby front ever since I got back from Midwest Miniature Madness in June. Mainly due to vacationing and holidays. This week saw only one night of hobby and that was only a little bit of assembly time on Sunday and a couple hours of paint time on Monday night, in which I started working on Takata from MidKnight Heroes for the Golden Kobold at GenCon. Long ago, when I first started collecting Skitarii, I grew weary of the shooting pose used for the Transauranic Arquebus. 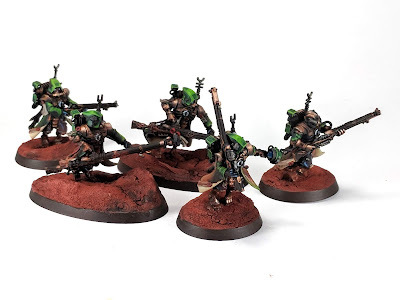 My first attempt to switch it up came in the form of the crouching sniper in my first ranger squad. I knew that I wanted to run two squads of snipers, and that I would modify the other two snipers to switch up the poses from the aiming pose. But what to do? As yesterday was Independence Day and I was busy all day, I didn't get a chance to do this week's Wizardry in Progress. So here it is, a day late. But, better late than never I suppose. This week I started playing around with my new Leviathan Dreadnought, which arrived while I was gone to Illinois for Midwest Miniature Madness. He's been an interesting build and he's packed to the gills with magnets! The only other thing to happen this week was an unpacking of my painting equipment and getting my desk set back up. It's been a busy few weeks, but I'm hyped to get back to work in my dedicated studio space. Hey everyone, the Golden Kobold is returning to GenCon! Last year's competition was an astounding success and we had many more entries than we expected. There were a few hiccups and lessons learned, but they served to make things better. I'll be returning to GenCon this year and helping to judge entrants once again. I'll be at the Ninja Division booth most of the weekend, accepting entries, talking hobby and painting chibis! It should be a good time! This big fella is part of an army commission that I am doing for a friend of mine. He's been painted for awhile now, but I have just now gotten nice pictures of him. He, along with the Death Company Chaplain, are the first two models from the commission to be finished. I have a soft spot for painting Dreadnoughts and this guy was fun to work in. It helped me hone my skill at painting black some more and solidified my technique. Lonely Havocs Battle Report: Nurgle vs Admech! While I was Midwest Miniature Madness over the previous weekend, Dan of The Lonely Havocs and myself squared off on the field of battle! He used his Nurgle Marines and a Renegade Knight and I with my Adeptus Mechanicus. It was a good time, and we went late into the night playing and recording the commentary. Check out the video below! This week on Let's Paint its a special 5 color painting challenge, featuring an Intercessors Primaris Space Marine! This model was donated to us by alphadevilinak on Twitter so that Dan of the Lonely Havocs and myself could square off in a paint off. For this model I used Mephison Red, Yriel Yellow, Black, White and Leadbelcher. I'm really pleased with the results. Check out the video after the break to see it all come together. Last week I was traveling on Thursday, and didn't get a chance to do a post for Part 3 of Deadpool! Shame on me. It has been up for a week now though and is here for your viewing pleasure! I have returned from Midwest Miniature Madness triumphant! It was a small convention, but I met a few people and was able to talk a lot of hobby with folks. While there I painted up the C'thulhu bust from Black Heart Models, Kommander Sorscha bust from Privateer Press and was challenged to a 5 color only Intercessor paint challenge. I recorded all of it and it will all be released on YouTube soon! The build up to Midwest Miniature Madness and my Battle Report with The Lonely Havocs continues! All things have halted while I work on finishing up my army for the battle report video. This week I painted a 3 man squad of Kataphron Destroyers and a new 5 man squad of Skitarii Rangers! If you've been coming to the site for awhile, you may have noticed a bit of housekeeping going on and some new additions to the side bar. I am an Amazon Affiliate and also have started up on Ko-fi. Here's the run down. It's a bit of a wall o' text, so bear with me. The Skitarii have a new leader! 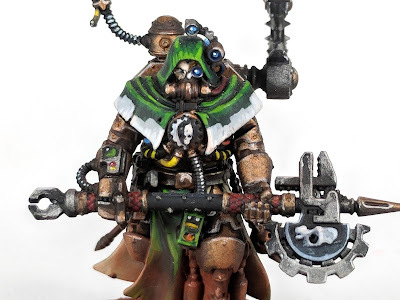 A new Tech-Priest Dominus joins the battle! Ever since I finished my original Dominus, I wanted to do another conversion using a Techmarine as the basis of it. For this one I blended a Tech-Priest Dominus, Tech-Priest Engineseer and the Techmarine. I had originally wanted to do a model styled after Gizmoduck, but didn't care for the options I had for tires. In the end, I went with a more cyborg human and I'm really pleased with how it turned out. It's time for part two of Let's Paint featuring Deadpool from Knight Models! In this one we're going to finish off Deadpool himself, starting with the red sections of the super suit and then his leather strapping. Hey everyone, I have some exciting news! I'm taking Let's Paint on the road and will be in St. Louis for Midwest Miniature Madness in the Gateway Center on June 22-24th! I'll have a table set up with all of my painting gear, lamps and recording stuffs. While there I'll be painting miniatures all weekend long for Let's Paint videos. Better late than never. I forgot all about last week's write up! So, this last week is double the fun. Last week, the main thing that happened was a rework of my desk, I cleaned it up and moved my lamps around. I also got a new frame for the picture of us with Cary Elwes and properly hung it up on the wall. Other than that, I started on a Librarian by painting his face, then I began painting new additions to Admech army with a new Tech-Priest Dominus. I made a new mold for Kastelan Robot heads and cast a clear head for my buddy Greg. This week, I finished the Dominus and started making bases for the new Skitarii Vanguard plasma dudes and bases for the Kataphron Destroyers. A buddy of mine has asked me to paint up his Blood Angels, and I've been slowly making progress on it. This Chaplain helped serve as the test model for the Death Company models of his army. While most of the model is black and red, I decided to try a few new things out on him and am really pleased with the results. This week for Let's Paint I have a new series of videos starting. 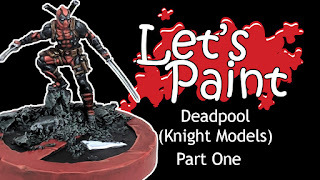 In this series, I'll be painting Deadpool from Knight Models and their now out of print Marvel Miniatures Game. This piece was given to my friend Jeremy for his 40th birthday, as he's the biggest Deadpool fan I know. I'd had this model in my collection for awhile looking for the best opportunity to paint it up and give it to him. Luckily Deadpool 2 and his birthday kind of coincided and I was able to give it to him after we went to the movie. This is a three part series. In this first video, I lay down the base coats and get a start on Deadpool's suit. 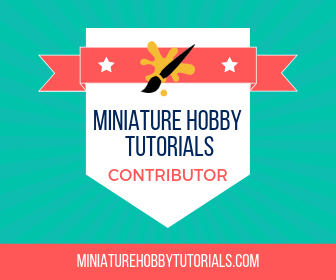 Miniature Monday: Mary Fit-It and G.R.I.T.T. At Adepticon this year, my friends at Panda Cult Games were selling a bust to help promote their upcoming board game Wander: The Cult of Barnacle Bay, which had a very successful Kickstarter run and has proven so popular at the demo tables that I personally haven't been able to get a game of it demoed. It's time for Wizardry in Progress! 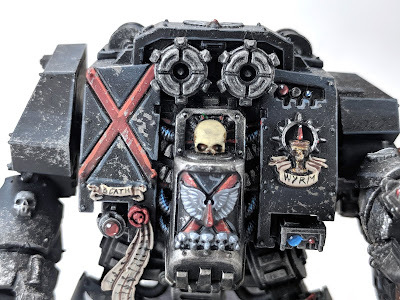 This week I played around with bitz some more and customized a couple more Deathwatch duders and a new Tech-Priest Dominus. I also painted one of the minis I built last week as a test model for my Deathwing painting scheme. 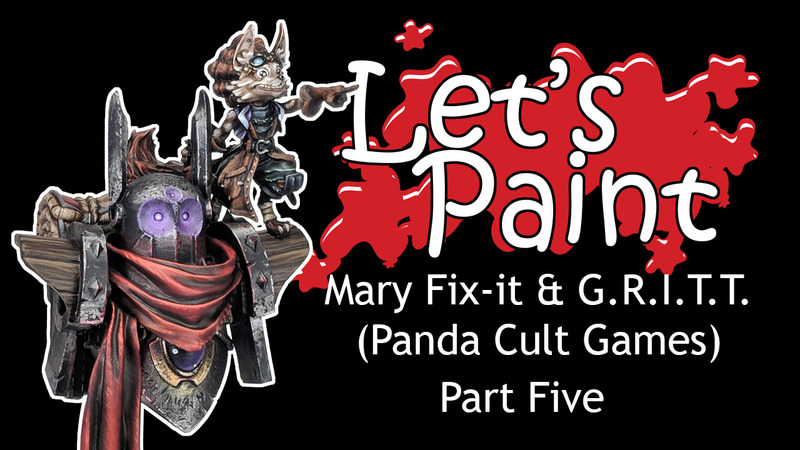 I totally forgot to post this last week, but episode 6 of the Mary Fix-It bust is up on YouTube! In this one, I get started on Mary herself, mostly painting her fur and face. The light is nearing the end of the tunnel and tomorrow I'll have her final episode! This is a special Miniature Monday, as I can now fully share this fella. He is a dwarf barbarian for my buddy's son, who plays D&D with us every other Sunday. This isn't his first RPG experience with us, he played RuneQuest with us as well. But, since his birthday rolled around recently, I decided to paint him up a character miniature to give to him for D&D since that's the game we're playing currently. This guy was the 2nd robot that I painted. He's also one of my favorites, thanks to the armor colors and how well they work together. He's also the one with the least amount of wear and tear. He doesn't have any battle damage where the two colors meet and only heavy damage on his fists. Alrighty folks, its time for my favorite part of this series! This episode is all about painting the bedroll on the top of the backpack! This one was really fun to do and I ended up needing to bust out a piece of paper to paint on, in order to get the pattern for the blanket figured out. It was fun to do. Enjoy! This was a thin week for hobby. I spent the better part of the week messing around with car troubles and looking at replacements. On the hobby front, I primed the next squad of models for the Blood Angels commission, which is a squad of Vanguard Veterans, and got some tactical marines ready for paint as well. I also made a plinth for the Mary Fix-It and G.R.I.T.T. bust and was able to finish off her final video. This post is long overdue, as the Tech-Priest Enginseer has been done for months and has seen many a battlefield. He's the first HQ that I finished for my army and he was my Warlord in my Adepticon Friendly list. So, let's take a look at him. Hey everybody, it's time for part four of the Let's Paint series featuring Mary Fix-It and G.R.I.T.T. from Panda Cult Games! In this episode, I start working on G.R.I.T.T. 's backpack, painting the leather. It is one of my favorite parts of the entire model, along with the bedroll. Check out the video after the break, thanks for watching! It's going to be a quick Wizardry in Progress this week. I've been sick all week and am not thinking straight, thanks to cold medicine. This week, I managed to get the Death Company Dreadnought finished and I painted up a Dwarf for D&D. There's been a lot of Monday posts lately that have been old models. Let's take a look at a newer one, and by newer I mean very, very new. 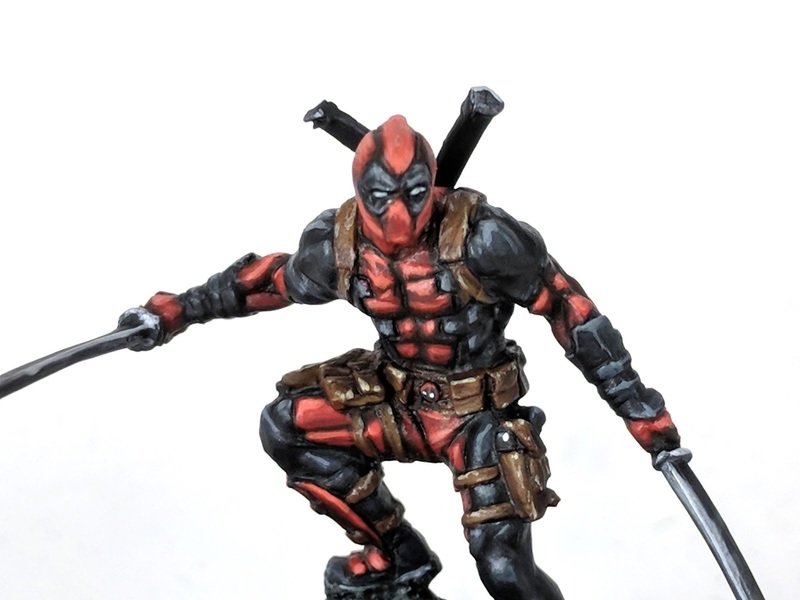 This week, we are taking a look at Deadpool from the Marvel Miniatures Game by Knight Models. Hey everybody! It's time for the part three of painting the Mary Fix-It and G.R.I.T.T. bust! In this part I finish off G.R.I.T.T. by painting his arms and the wooden pauldrons, which was one of my favorite parts of the entire piece! It's time for Wizardry in Progress. This week, I finished Deadpool and got started on the next piece for the Blood Angels commission, a Death Company Dreadnaught. I love how Deadpool turned out, and I am pretty pleased with the Dread so far, though I wasn't really feeling it when I first started him. 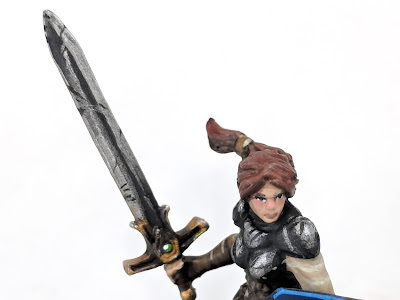 For today's Miniature Monday, I have a converted WizKids Nozlur's Marvelous Miniature of the female human fighter. She originally had a shortsword, which I swapped out to a longsword and added in a shield. Funny story about this miniature. Talia is actually my RuneQuest character Talgrimm, who was killed in battle and then reincarnated by a goddess. She needed a body to plant my soul into and my party decided to use a female body, because they are a group of jack asses. Hey everybody! It's time for part two of the Let's Paint of Mary Fix-It and G.R.I.T.T. from Panda Cult Games. In this episode, I'll be painting the red scarf as well as finishing up the metals on the torso and the head! It's time to check in and see what has happened in the past week! That means it's time for Wizardry in Progress! This week, I finished off the Death Company Chaplain and started on a new projected featuring the Knight Models Deadpool miniature. Hey everybody, today we're going to take a look at Diva, the Blessed. This model was released last year as part of Reaper's anniversary line of models. Each model was only available during a certain month, and then no longer to be seen again. Diva, the Blessed was available during the month of September, 2017. Anyone that knows me well, knows how much I dislike the idea of exclusive models and the idea of showing them off, only to get folk's hopes up and have them find out that it is no longer available. This one fit a character concept I had perfectly though and after finding out that she was no longer available, I was lucky enough to be able to snag this one a month or so later at the local games shop. Let's take a look at her! Hey everybody! Today I have part one of a seven part series for Let's Paint, featuring Mary Fix-it from my friends over a Panda Cult Games! In this episode, I paint the lower torso and the gemstone. You can find the video after the break. Thanks for watching! It's a pretty light week this week, as far as painting goes. We had a massive snow and ice storm this weekend and I didn't do much of anything. There were power outages all around me and I didn't want to worry about painting and then losing electricity and lighting in the middle of it all. That said, this week I started on a Blood Angels commission for a friend of mine, I generally don't do commission work but I broke down on this one, so we could have another player in our growing Warhammer 40k group. Over the last week I started playing with list builds and came up with a new list that I really wanted to try out. So, Tuesday night, I built some extra models for my Admech army using left over kit pieces and the models in the Forgebane box set. I also did a bunch of video editing of the video I recorded for the Mary Fix-it bust. I'll be pushing those out soon! While I'm going out of order by showcasing this fella before the orange robo, he has become something of the star of the Kastelan Robots. The white robo tends to get singled out, whenever I show the robos to new people. Something about the weathering, the spider web crack and just the overall look of him hits on all cylinders. He also happens to be my favorite as well. Possibly because of the white/grey armor plating and how much trouble I had making it all work. Seeing him come together definitely gave me a major sense of accomplishment. It's time for Wizardry in Progress! This week, I made a couple new Skitarii Rangers, finished the Mary Fix-it bust and also finished the first batch of terrain for my FLGS. I painted Zugg over a year ago now. He was meant to play alongside the Tri-City Sentinels as a Star Player and he was the first of many Blood Blow Star Players I bought. I painted him just before Adepticon, and was planning to meet up with some friends to play games of Blood Bowl. But Adepticon being a social gathering that it is, those games never happened. 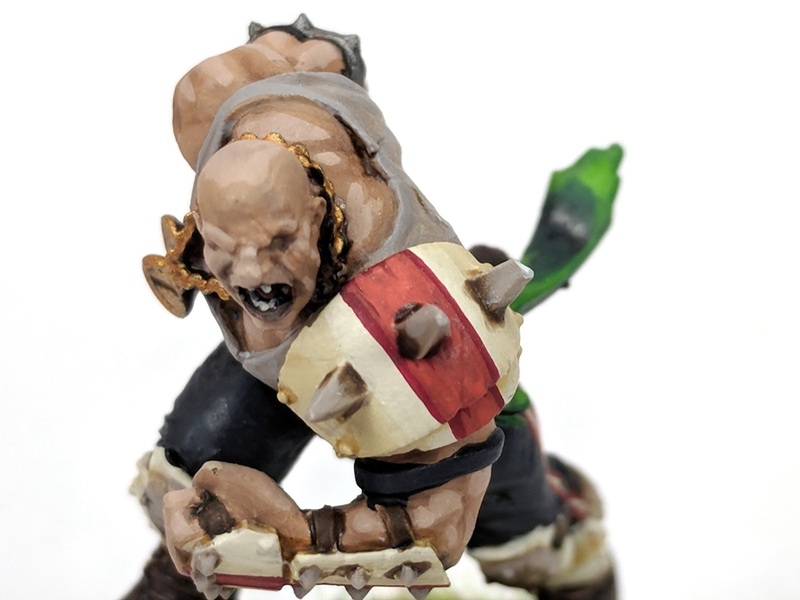 My interest in playing Blood Bowl then waned considerably and I sold off most of my unpainted Star Players and the unpainted, unassembled Dwarf and Skaven teams. 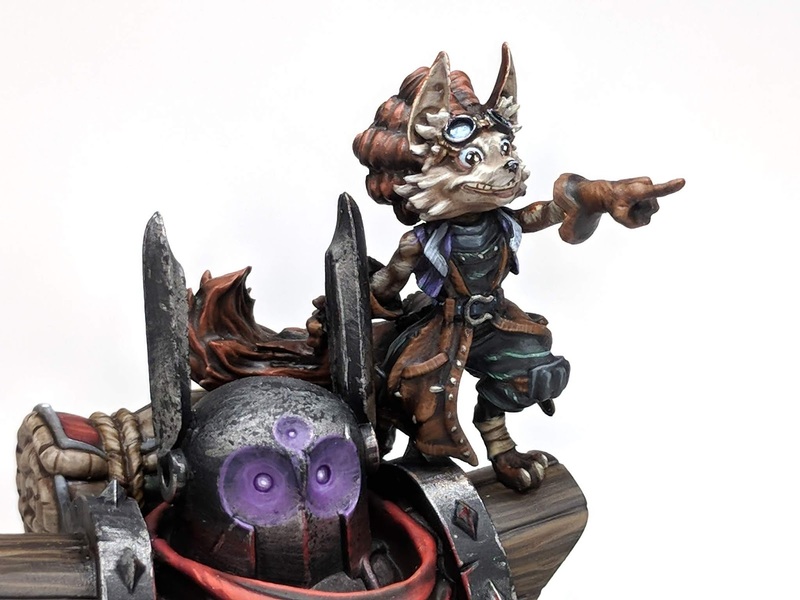 Since it was so close to Adepticon when I finished him, I didn't write up a post about him. So, we're fixing that today. I give you, Zugg star of the Tri-City Sentinels! Adepticon is over and great times were had by all. After nearly a week of no hobby, it is time to get back on the hobby train and knock out new projects. I'm excited to see fresh things that aren't my Adeptus Mechanicus for a while. Though I am not abandoning my army for new things, I did learn a lot about them and how they play. I now know where my weaknesses are in the list and in my play style. In time, I'll make additions to the list and try to make them better. Anyway, its time for Wizardry in Progress. This week I started working on a terrain commission for my FLGS. It'll be a fairly quick tabletop paint job, But it should be fun. It's time for the second half of the Blood Bowl box set, the Orcs. I named these guys the Waaaghington Cleavers (which is so much easier to pronounce now that I know the first G is silent). Their colors are a nice bright yellow with checkers, and they ended up looking excellent! Again, like the Tri-City Sentinels post, this one is more of a showcase than anything. Its been so long since I painted these, that I can't remember a lot of the details. The second robot to be finished, the black one was a blast to work on and I learned a lot from it, one of which was that I apparently have painting black figured out. Before I painted this fella, I dreaded painting black, and never seemed to be able to get it really figured out. This one was also the first robot with one of the recast heads on him, this one being the red eyed one. All in all, I love how he turned out. It's the last Wednesday before Adepticon, the pressure is on to get projects finished and everything ready to go. I can happily report that my Admech army is now finished and ready for games. Let's take a look at what has happened in the last week. Hey everybody, after doing a couple videos for the Cybernetica Datasmith and the Sydonian Dragoon, I feel like I can safely say; welcome to a new feature of the site, the Let's Paint video series! 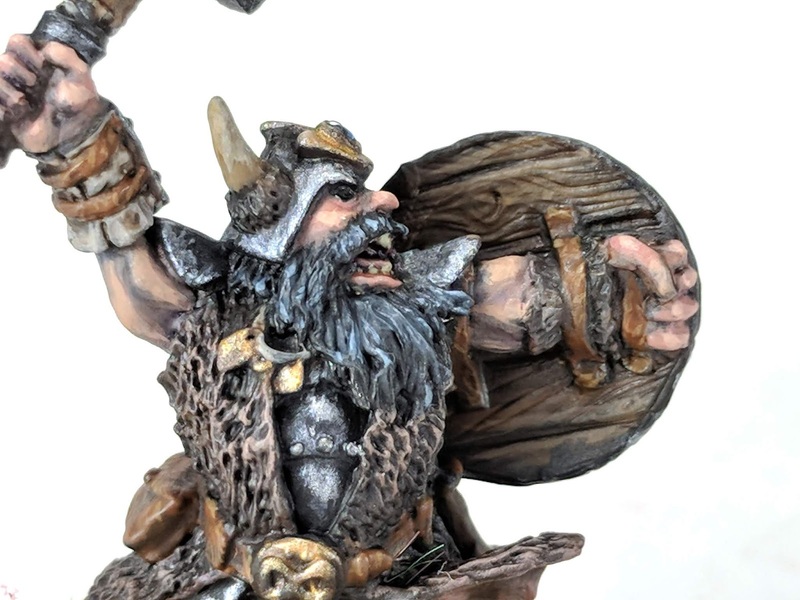 In this series, I will be painting a miniature from start to finish in time lapse video. They are really fun to make and share and I hope to keep this to a once a week feature. But with Adepticon around the corner, I'm unsure about keeping that pace until after the event. But for now, let's paint a Kastelan Robot, shall we? When Blood Bowl was released, I was all about it. The hype train was full steam ahead and I was so stoked at getting it painted and on the table. The first order of business was to paint up the human side of the game, which I have written about earlier, but the bases weren't finished and I didn't get any nice pictures of them, so I kinda jumped the gun a little bit on posting about them. But, that's all fixed now. Let's take a look! The pressure builds as Adepticon nears! The army progress chart is filling up and the forcing is coming together nicely. This week, I finished another robo and got started on the next one in the batch. 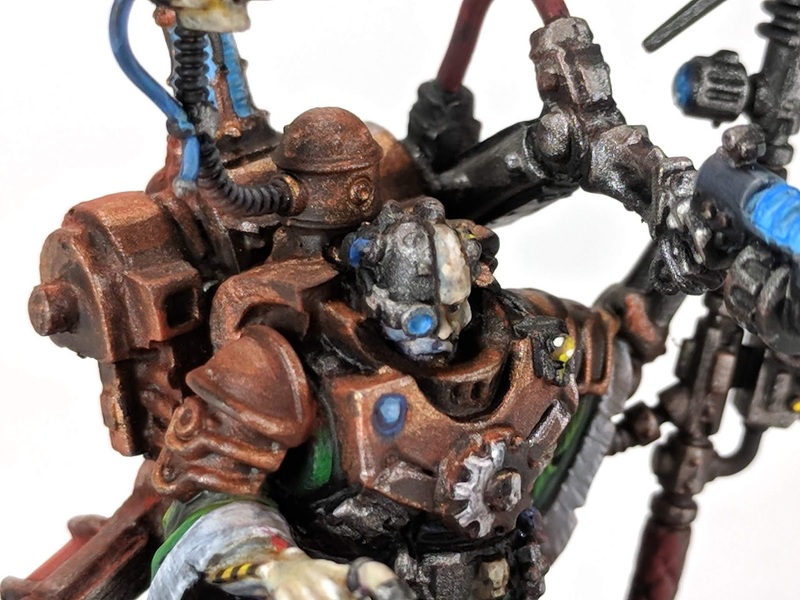 We're down to two Kastelan Robots needed for Adepticon, let's take a look. The last Sydonian Dragoon is all finished and its time for a legit write up on him! He had a bit of conversion work and was a blast to paint up. It also seemed to take less time to do than the first one, probably because I had the previous paint job to use as reference and didn't have to figure out what parts needed to be which colors. February is over and Adepticon is now less than a month away and the pressure is on! I am now on to the last 4 Kastelan Robots. So that means from here on out its all robos all the time. Over the last week I've managed to finish one and get a decent amount of progress on the next one too. Also I finished the vats in a mad dash to get them done before the tournament on Saturday. We recently started a new Dungeons and Dragons 3.5 campaign and that means, a new character! Usually in D&D I like playing rogues or rangers and stealthy types. But I wanted to try something different and went with a caster class, the sorcerer. Since I'm usually a rogue player I like small races and went with a Ghostwise Halfling for my race choice. Unfortunatly, finding a suitable halfling miniature for a caster is no fun at all. You can find gnomes all day long, but more halflings look like either knock-off Bilbo Baggins or are rogues. With that in mind, I looked at gnome miniatures instead and found the miniature that I was looking for. February is nearly over already and my local Warhammer 40k group is having a tournament this weekend, and I desperately needed to get the Sydonian Dragoon finished for it. I'm happy to report that I have finished it and also started on my objective markers. Let's take a look at what has happened over the passed week! Kastelan Robots are probably my favorite model in the Adeptus Mechanicus line of Warhammer 40,000 models. They're big stompy bots, which aren't cyborgs and need to be controlled by a handler in order to operate on the battlefield. They also are very old, in 40k terms, older than the Imperium of Man. That gave me plenty of ideas to go with. For my army, I knew that I wanted to have the robots in diffferent colors than the green that is seen across the rest of my army. The idea being that these guys collect robos and use parts from other fallen robots to rebuild two downed robos into one operational robo. The first of many Kastelan Robots, this guy was my test run on painting them as much as he was also my first one for my army. His eyes were also the subject of my tutorial on painting glowing eyes. The brushes of progress continue to paint and in the past week I've managed to finish the Skitarii Vanguard squad, start on the actual model for the next Sydonian Dragoon, build another Robo and more terrain, including an update to the Tech-Priest Dominus. Its been a busy week, let's take a look! 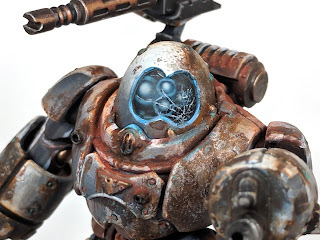 This week for Miniature Monday, we are going to take a break from Adeptus Mechanicus models and show off something from last year that I totally forgot to post about. Today going to show you Huckleberry, from Rail Raiders Infinite, who is based on Doc Holiday of Tombstone and the legendary old west tales of Wyatt Earp. Rail Raiders Infinite is a train heist board game by Ninja Division where players take the role of an outlaw attempting to make off with more double dollars than anyone else. It features a bunch of chibi styled western characters, many of whom are parodies of famous TV and anime characters. Hey everybody, welcome to Wizardry in Progress! This week we continue on with Adeptus Mechanicus models in a push to complete them in time for Adepticon. But I also have a bit of terrain to talk about as well, which is quickly becoming a new addiction. This week, we're still on the Admech train as I work my way through my Adepticon army list. I've finished the black armored robot, the Datasmith, modified a Sydonian Dragoon and started on the next group of Skitarii Vanguard! Such progress, much wow. Let's take a gander. Hey everyone, today I have a post on how to paint glowing eyes, as seen on the blue Kastelan Robot that I have been posting on Twitter and Instagram. This is no ordinary tutorial post though. This is a video! The first video tutorial I've ever done and I hope to continue on with them and post a new tutorial every month this year. If all goes well, I may go back and make videos of past tutorials as well and add them to their respective posts to. While I am a big fan of the Vanguard, the Rangers are probably a notch higher when it comes to how much I like the look of them. There's something about their coats along with their hooded heads that I really like. But since I preferred the Vanguard's rifles over the Ranger's, I passed on using Rangers as the main body of my force. But, that meant I got to use the Rangers for something even more fun. There are two models that sold me on Adeptus Mechanicus, one is the Onager Dunecrawler and the other is the model we're talking about today. The Sydonian Dragoons, aka the chicken walker. These guys sold me on starting an Admech army, hands down. The look unlike anything else I'd seen in Warhammer 40,000 at that point, they rock a sweet jousting lance and they are powered by a quadruple amputee in a gimp suit. What's not to love? When Skitarii launched, I ordered two of them without hesitation and now I have one all fully painted and ready to go. Welcome to Wizardry in Progress, my weekly recap of projects and progress over the past week. This week, a Kastelan Robot has taken up most of the hobby time. Lets take a look! It's a new year and its time to make WIP Wednesday into its own weekly post! Rather than randomly posting WIP pictures when I feel like I have something to talk about, I'm going to pool it all together into a summary of what's happened each week. With that said, welcome to the first post in a new series called Wizardry in Progress, here I'll share what I've worked on over the last week, with pictures and commentary of each, in the hopes to keep myself motivated and to keep posting on a regular basis. It could be a single big project or it could be multiple large projects. But each week I'll be gathering up images and talking about progress! Eventually, I'll have a logo for this too. But for now, let's get to it! 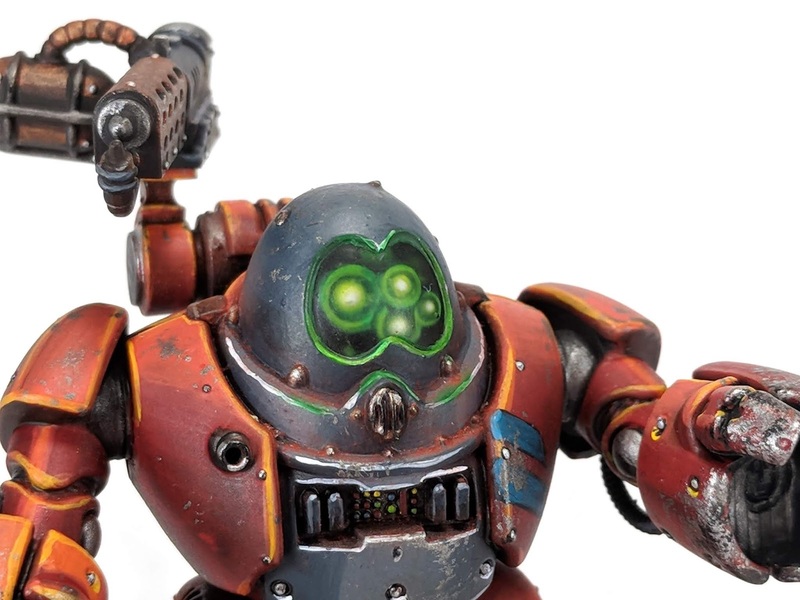 Its no secret that the Kastelan Robots are one of my favorite models from the Adeptus Mechanicus faction of Warhammer 40,000. I just really love the idea of big stompy robots, and I am a fan of the retro-future look of them. Ever since I first saw them, I wanted to run an army of them. Each one painted up as an individual, and not just a tide of the same color scheme. The ideas in my head were endless.